Personnel numbers are assigned automatically from an internal range. Delete the entry in the Personnel Number field – the system will provide the number. You need to enter a valid "Reason for Action"
This happens when hiring several employees in the same session. The system defaults to the Personnel Area of the person you hired last hired in the session – What to do. This position may have more than one incumbent. It is appropriate to have more than one person in a position in the following circumstances; For a handover period two employees occupy the position. The position is designed to have multiple occupants – eg. Contractors may be set up in one position. Amount is impermissible entry This wage type does not allow direct entry of an amount. The wage type characteristics (table T511) have been set up to allow the entry of a number of units instead. Enter an amount with no number or unit. Do not enter units for wage type xxxx Clear these fields and enter an amount instead. Please enter an amount Both number and amount are blank. Enter a value as appropriate. Check table T510w to ensure that all the ESG for CAP point to the correct period modifiers rather than a default one. Check that you have chosen the correct payroll area on the selection screen. Check that the employee is active in the chosen payroll period. ATTENTION: Please check Basic Pay data The field “Monthly Working Hours” in IT 0007 must have the same value as “Work hours/period” in IT 0008. This value is fed into the field on IT 0008 from IT 0007 when the initial hire action is carried out. Use a dynamic action (table T588Z) to update this field on IT 0007 whenever IT 0008 is modified. Monthly WS deleted or does not exist for dd.mm.yyyy The work schedule allocated to this employee has not been generated. No data stored for xxxxxx in the selected period The date or radio button in the “Period” box is before the employee’s hire date. Change the period by inserting specific start and end dates. You have locked key PREL ######## [Pers No.] The employee is currently being maintained in another session. Close one of the sessions and continue to maintain the employee. Key PREL ######## locked by user ######## The employee is being maintained by another user. Use transaction code PA20 if you only wish to display information. Contact the other user – who may have finished updating this employee. Payroll area M1 is locked for on-line maintenance You have attempted to change payroll data whilst the payroll is locked for processing. Exit the current screen and wait until payroll processing is complete or change the control record (transaction code PA03) if you are not in your Production client and you have the required security access to do so. Data entry for correction period; payroll area M1 The change is being made whilst the payroll control record is in a correction. This will ensure that this employee will be processed as part of the next matchcode W payroll run. Enter data for payroll past (retrospective accounting) The master data changes made affects previously generated results. The employees infotype 3 (field: “Earliest MD Change”) will be updated to allow the payroll to carry out retroactive calculations. To period of record dd.mm.yyyy will be delimited to dd.mm.yyyy The existing infotype record will have the “To” date delimited to the day before the new record you have entered. This record will cause another record to be deleted The infotype record you are creating or changing will replace the previous infotype record. No Entry in Table xxxxx Entries need to be added to this table. Use transaction code SM31 to add the entries. If you would like to know where in the IMG these entries are entered – use the customising option on SM31. Wage Type not allowed for ESG/PSG … This relates to wage type permissibility. Check the settings on table T511_B for the wage type’s entries for ESG or PSG. Check to see whether this employee should, in fact, be allowed this wage type. If they are, then amend the configuration. 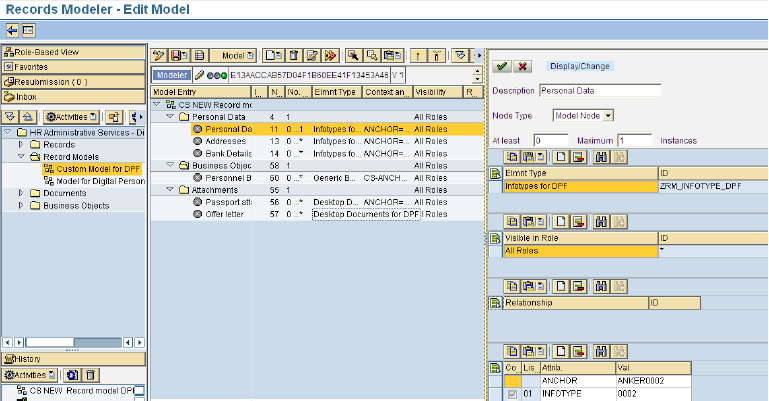 SAP HR Payroll is basically controlled by 4 status of a Payroll Control Record. Payroll Control Record is tied to employee via IT0001. Past and present HR Master Data is locked for those particular employees. However ,future dated changes in master data are permitted in your SAP system. If the payroll is released from the “Exit” stage, the system rolls into the next payroll period, increases the payroll area period number by 1 in the Payroll Control Record (for example, from period 01/2012 to 02/2012). If errors occur, you will get a list of employees rejected during the payroll run. The system has stored the employees rejected during the payroll run in something called “Matchcode W”. Payroll Control Record is set to “Released for Correction”. Past and present HR Master Data for those particular employees is now unlocked for corrections. You should make appropriate corrections to fix the payroll errors for example adjusting data in IT0008, IT0014, IT0015, IT2010, etc..
Once you have made the appropriate corrections, you need to Release Payroll and Start Payroll using Matchcode W, which will only select the employees that were rejected during the previous payroll run. You can cycle between the “Released for Corrections” and “Released for Payroll” stages as many times as necessary. Payroll Control Record is set to Exit Payroll. Past and present HR Master Data for those particular employees is now unlocked in your SAP system. The payroll run is closed off for the particular period. You cannot go backwards in respect to payroll results. Banking details cannot be created or changed for pay periods that have already had the EFT transfer run. Change the "From" date to the start of the next pay period. System Applications and Products (SAP) is the world’s largest provider of Enterprise Resource Planning solutions in the world. An Enterprise Resource Planning system is a business support system that maintains in a single database the data required for a variety of business functions such as Manufacturing, Supply Chain Management, Financials, Projects, Human Resources and Customer Relationship Management. 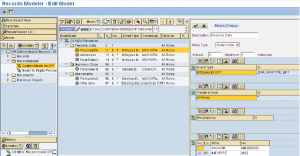 After creating element types and parameter assignment, record model would be created with these element types in ORGANIZER. For each component in record model we have to assign element type id and anchor data as shown below.